Take advantage of the tomato season while you still can. It still hasn’t cooled off yet, and sometimes it takes more than an ice cold drink to cool you off after a long hot day. Some nights call for a cool, crisp meal as well. This salad is perfect for dinner parties, potluck picnics or just a snack, and requires only six basic ingredients. Tomato season is almost over, so take advantage of the freshness of the fruit! 1. Wash and thinly slice cucumber and tomatoes and set aside. 2. 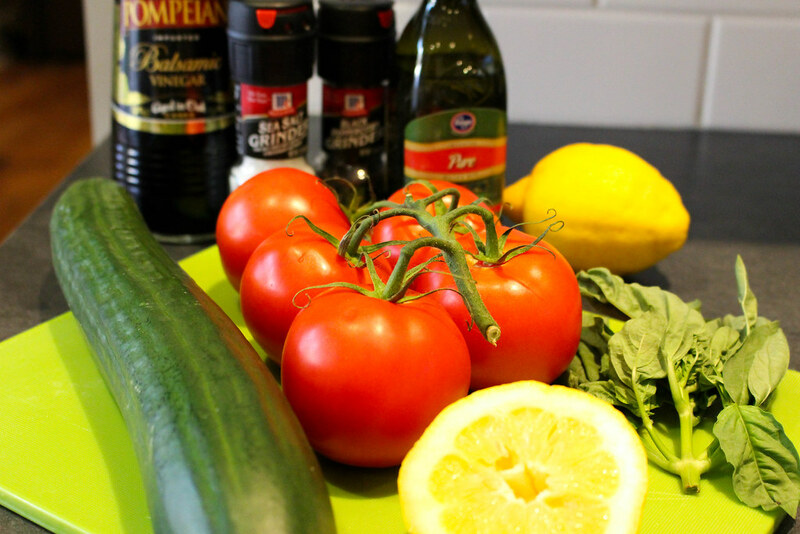 Combine olive oil, balsamic vinegar, lemon juice, salt and pepper in a small bowl and set aside. 3. 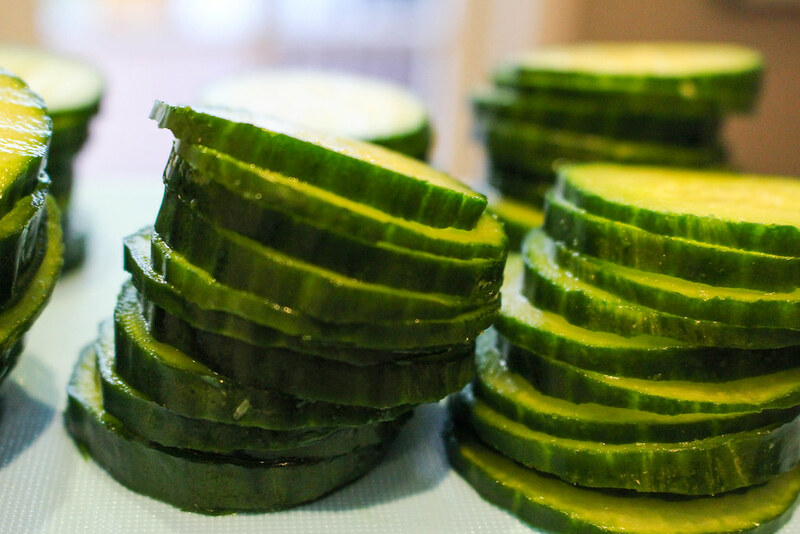 Arrange the pre-sliced cucumber and tomato in a shallow dish, alternating between the two. 4. Rip the basil leaves into roughly dime sized pieces and sandwich between cucumber and tomato slices. 4. 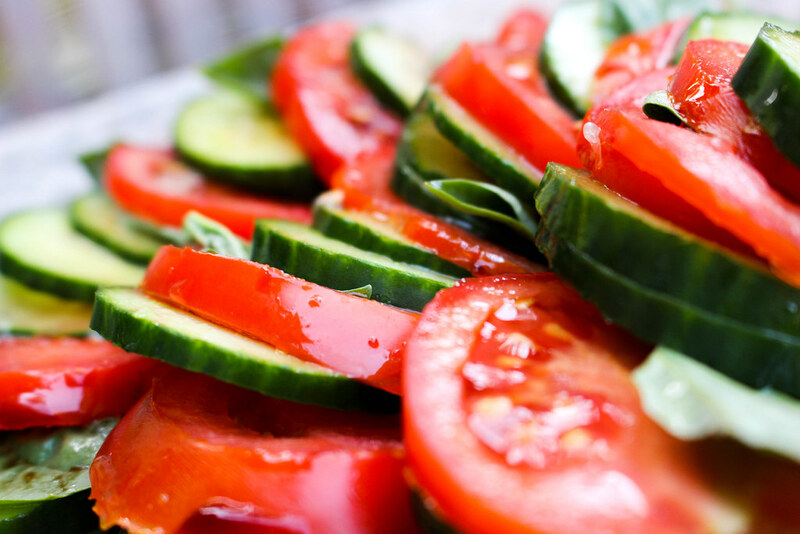 Drizzle the oil and vinegar over the cucumber and tomato, cover and refrigerate for 15 minutes. My favorite part of this salad is that it gets better with age! I’m not talking years or weeks, but these next-day leftovers are full of flavor. Overnight, the veggies absorb all the flavorful basil and balsamic to make a delicious mid-afternoon reviving snack.